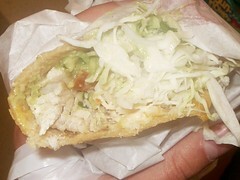 Rubio’s Fresh Mexican Grill fish taco boxing. In the top photo, we have the challenger, the $2.99 Mahi Mahi Fish Taco from Rubio's. In the bottom photo, we have the defending champion, the Rubio's customer favorite, the $1.69 'World Famous' Fish Taco, Beer Batter style. The Mahi Mahi made the first move. And by that I mean I ate it first. It was elegant, not fried, held a modest weight advantage, and if I remember right, came with a touch of guacamole. The smaller Beer Batter struck back quick and hard in round two with a deep fried ferocity. This fight would have to go to the judges. The Beer Batter was definitely less filling, but also less expensive. I theorized that the fried nature of the Beer Batter must be unhealthy. 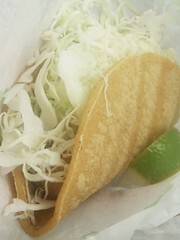 However, when going to the card (nutritional information) both tacos are about the same. The Mahi Mahi's health advantage having been mitigated, Beer Batter was named the winner, and defended the title. This Rubio's Fresh Mexican Grill meal was rated: 6.1. Friday, August 04, 2006 by Jonah.